In 1973 Mercantile Bank had 1500 employees scattered among 12 buildings around downtown St. Louis. The company thought that consolidating operations into one building would be better for the company. A large new building, three times larger than what it needed, would also provide the bank with space that it could lease to other businesses. Today it is easy to imagine the benefits to the urban fabric of so many workers being dispersed in smaller buildings throughout Downtown, but at the time popular thought ran the other direction. City leaders agreed with Mercantile—they thought a huge multi-million dollar building project would be very good for not only Downtown, but all of St. Louis. Mercantile Bank’s planned project, known as Mercantile Center, was one of the most ambitious in St. Louis history. It was not to be just one larger tower, but a series of towers grouped together. The first phase is what we know today—now called One US Bank Plaza. But there were were four other buildings planned for the site. These “second phase” buildings included a 25 story luxury hotel (ideally situated by the soon-to-be-expanded Cervantes Convention Center and large department stores), and three more office towers to be built in close succession: a 27 story tower in 1976-1978, a 24 story tower in 1977-1980, and a 51 story office tower in 1979-1983. It is easy to see why city officials were thrilled by the prospect of such a giant project in the heart of the city. City leaders and the bank boasted that no public assistance would be given to the project—except for generous tax breaks and liberal use of eminent domain. St. Louis Post-Dispatch. Photos from 2 different articles about the demolitions on St. Charles Street. Left is from July 1973, Right is from March 1972. Demolitions on St. Charles Street began in March 1972—one building housed a “coffee and tea shop,” a “tavern,” and a sandwich shop. By June 1973 Mercantile’s eminent domain permanently closed St. Charles Street between 7th and 8th streets. A park on Washington Avenue, the only park in the shopping district, was closed to the public. Details of the eminent domain process are staggering. Today when it a persistent goal to attract and retain businesses in the central business district, it is difficult to understand the casual attitude the city had with regard to forcing out street-level operations in anticipation of the Mercantile project. The project area included a six block area bordered by Locust, Broadway, Washington, and 8th. Long-established businesses were forced to leave Downtown. Newspapers were quick to mention that the area had been declared “blighted,” despite the business activity there, and therefore a prime candidate for corporate redevelopment. St. Louis Post-Dispatch. Another photo from March 1972 showing the buildings designated for demolition. The city’s category of “renewed or blighted” was broad. 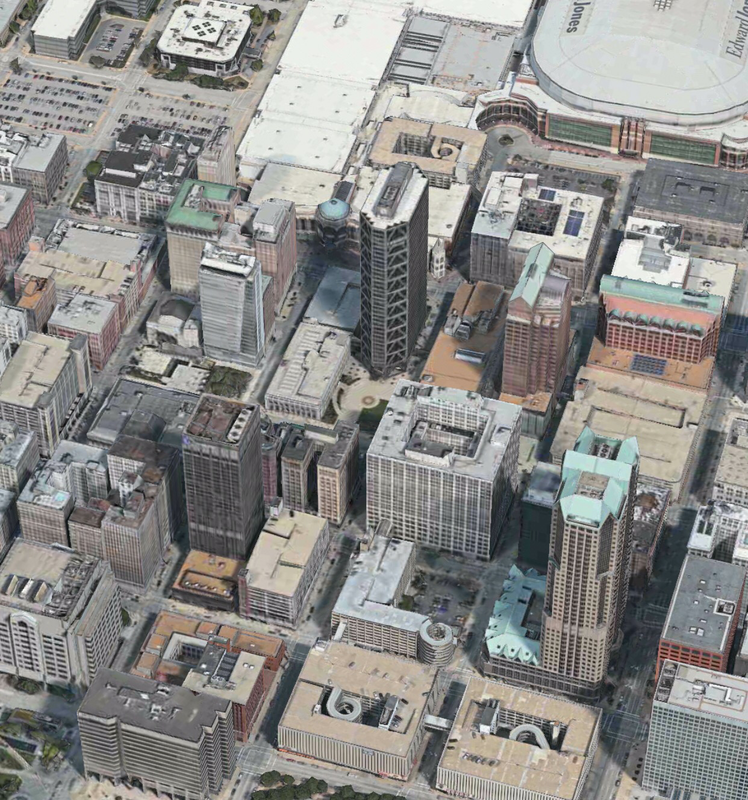 The Post-Dispatch said that a part of the six block area designated for the project, a half-block section bordered by Broadway, Pine, 4th, and Chestnut, was the only part of Downtown that had not been designated as “renewed or blighted” by the St. Louis Plan Commission. Feature on the new Mercantile Center with advertisement for the new West Port Plaza office park on the previous page. St. Louis Commerce Magazine, September 1973. Businesses affected by the project included the 78 year old Thomas Garland clothing store at 410 N 6th St, the 70 year old SS Krege store at 522 Washington Ave, a 27 year old jewelry store at 426 N 6th St, Worth’s at 514 Washington, Cunningham’s clothing store, and one of Zale’s two downtown jewelry stores. Business owners clearly thought the evictions spelled trouble for their bottom line. With cheap rents hard to find Downtown, many resolved to move or close their St. Louis operations. Herbert Engel, operator of the jewelry store at 426 N 6th St said, “There’s only one shopping street Downtown and that’s 6th Street. Off 6th Street, forget it.” The owner of Garland’s said he had no choice but to leave Downtown, and that he was going to move to a location off Warson Road in St. Louis County, as well as open other locations at St. Clair Square and South St. Louis County. But the situation grew complicated as Mercantile neglected to share the details of their plan’s timeline with business owners and the city government. Business owners, some who had leases extending into the early 1980s, hesitated to pack up right away. Despite the demolitions, by 1977 it was clear that Mercantile’s plan was behind schedule. The main tower and an accompanying parking garage were completed in 1976 , but the remainder of the building site was stagnant. The Post-Dispatch writes that the area was “slipping further and further” thanks to the building losses, business closings, and other changes to the neighborhood. Mercantile now owned most of the buildings in the area, but instead of a luxury hotel, there were just boarded up windows. A thriving downtown shopping district was no more. Complicating Mercantile’s plans further, Boatman’s Bank, to whom Mercantile had planned to lease the new office tower’s extra space, announced that it was going to build their own tower. Mercantile’s expectations for a partnership with Boatman’s was problematic considering that as early as February 1973, Boatman’s spoke of plans to build its own tower on the site of the Cotton Belt Building. A Mercantile spokesman said, “it took care of the market we had identified for our office building.” Mercantile did manage to convince Zales to relocate its operations to one of the now vacant buildings, but in the process Zales razed two additional “derelict” buildings for a parking lot. In February 1977 it was reported that the bank’s plan might be in default. The city was already acquainted with failed redevelopment projects; the Post-Dispatch mentions failed projects at Laclede’s Landing in 1969 and in the West End in 1975. Finally in November 1977 a St. Louis Alderman, Bruce Sommer, questioned Mercantile’s activity, saying that they were “bringing more harm than good to the area.” Mercantile, by falling behind on their schedule and failing to communicate their plans, was violating agreements with the city. Still, city leadership felt that it was better for Mercantile to finish the project if possible. In the end, none of the additional structures were built. The Spirit of St. Louis visitors guide, Cover page, November 16, 1924. The Ambassador Theatre at 411 N. 7th Street was positioned next to Mercantile Bank’s new officer tower. The Ambassador was completed in 1929, the same year as the Fox Theatre (the “rapidly declining” Fox Theatre according to the Post-Dispatch in 1979), and designed by Chicago firm Rapp and Rapp (some sources say C.W. Rapp) who also designed Powell Hall, home to the St. Louis Symphony since 1968. A visitor’s guide from 1926 tells how the Skouras Brothers, three St. Louis natives who owned a list of big St. Louis movie houses, had paid some $1.5 million for the half-block site, which fatefully shared an alley with the Mercantile Trust Company. The building was 17 stories tall. It’s auditorium, including a mezzanine and balcony, seated 4,000. Above the theatre were 11 floors of office space. There were also businesses at street level. I did not yet find any details of the Ambassador’s life as a grand movie theatre other than its retrofit in the 1950s with “Cinerama” technology (the Ambassador may have been the largest “Cinerama” theatre). The Ambassador functioned as a movie theatre until 1974. It closed for good in 1976. The offices above, and the shop-fronts below, continued to hold tenants after the theatre closed. I am not clear on who exactly owned and managed the Ambassador all those years between 1929 and 1976, but in 1979 the building had new owners: Barket, Levy, and Fine. Barket’s purchase was fortuitous for the Ambassador—it was almost in the hands of Jack Dubinsky and Sons Real Estate, which had just razed the Loew’s Mid-City Theater to build a fast food restaurant. The new owners said that they were committed to bringing the aging building back to glory, and that “rock concerts are out of the question.” They talked of making the Ambassador into a performing arts center or trying to “lure” the St. Louis Symphony to the Ambassador, saying that a Downtown home would be more “natural.” They also floated the idea of the Ambassador being the Symphony’s “winter home,” or as a place reserved for special kinds of concerts. Needless to say, the Symphony, who had been at the newly restored Powell Hall for only eleven years, did not take the bait. Barket struggled to find a lessee for the auditorium—the building was 65% occupied in 1980. In 1979, Barket had started talks with Jack McGovern, a successful entertainment developer based in Seattle. McGovern planned to spend $1.5 million renovating the Ambassador, but progress was slow. McGovern needed the blessings of the Building Division and the Community Development Agency. He needed to submit plans to the Landmarks and Urban Design Commission because the Ambassador “is a city landmark.” The building was listed as a city landmark in 1978 and listed on the National Register of Historic Places in 1983. McGovern planned to transform the auditorium into a dinner theatre exactly like the Fox Theatre he ran in Seattle. You could pay for dinner and a show, or just a show. The Ambassador’s location near the convention center seemed ideal for such an enterprise. Unfortunately, McGovern’s success was short-lived. In May 1980, McGovern suffered a heart attack, after which his business filed for bankruptcy. In 1981 another businessman, Ray Shephardson, also from Seattle, comes into the picture. Shepardson had been successful in restoring other old movie palaces in Ohio. “Anything but rock concerts,” he said. Clearly the restoration did not go to plan. Despite the lack of rock concerts, in March 1989 Keith Barket was selling the interior of the Ambassador at auction—300 people arrived to bid on chandeliers, marble fixtures, theatre seats, and sheet music. Everything was up for grabs. In attendance were Ronald Kreuger, President of Wehrenberg Theatres; Charles Forbes, the man who saved Detroit’s Fox Theatre; Ray Shephardson, the first manager of the now “renovated Fox Theatre” (just 10 years after the above mentioned reference). Forbes and Shephardson bought 1 of the 2 large chandeliers for $13,500, 4 smaller chandeliers for $3000 each, and 4 other light fixtures for $1000 each. One man bought all the handrails for $38,000. Another person bought thousands of pages of sheet music for $22,500. A woman from Soulard bought a painted curtain for $1000. Jack Randall, owner of a local art gallery, bought a statue of a woman riding a horse, which had been at the top of the stage, for $2500. Other purchased items include 4 stories of a 6 story spiral staircase, old movie posters, and brass curtain rods. St. Louis Post-Dispatch. March 13, 1989. The Post-Dispatch’s October 1996 report on the Ambassador Theatre demolition reads like a passage from a crime novel. The demolition was supposed to have been finished by July or August. But the process is complicated because the structure, composed largely of concrete-filled steel trusses, is so robustly built. A representative from the demolition company declines to reveal the cost. The bank built its plaza, which we can see today. Perhaps adding insult to injury, the bank adorned its plaza with terra cotta remnants of the vanished Ambassador. Following the demolition, Mercantile asked to have the property of the former Ambassador reassessed so that its property tax became almost zero. Mercantile argued that the market value had decreased from $1.6 million to $2000, and that the assessed value had decreased from $538,700 to $640.